Wikipedia's Earth article also gives ‘about’ 71% (with 29% land) and also cites the perhaps more precise figures of 70.8% / 29.2% found on this University of British Columbia Okanagan page, but none of these sources say when these estimates were first made. about three fourths of the surface of the globe. However, this source does not include Antarctica, the last continent to be discovered, which accounts for 9.2% of earth's land area, and around 2.6% of the earth’s surface. Antarctica was discovered in the early 1820s, but it was not until in the late 1830s / early 1840s that three expeditions sailed around the continent. Not until several decades later, from the late 1890s, were there many expeditions to Antarctica. 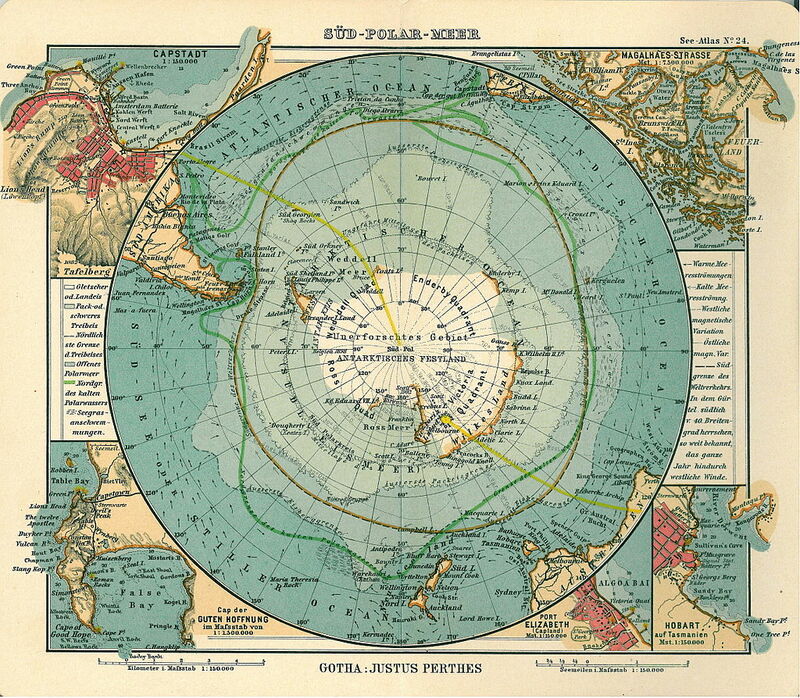 The map below, dated 1906, appears to be one of the earliest Antarctica maps in which the continent’s shape is reasonably recognizable (there is also what appears to be a less accurate one from 1897). While useful and informative, the comments unfortunately do not provide a date and focus more on the ‘how’ than the ‘when’. I am not asking ‘how’ (that would almost certainly be off-topic) but about ‘when’. Further, none of the sources cited (USGS, Wkipedia, University of British Columbia Okanagan) mention tides, seasonal cycles or the fractal nature of coastlines as affecting the percentages they cite, nor have I found any sources which give me reason to question the existing narrative (‘about 71% / 29%’ or 70.8% / 29.2%). Browse other questions tagged 20th-century 19th-century maps geography or ask your own question. English society in the early 19th century: Was aristocracy including royal members?